Once you know how, It’s easy... to make your own light box - one that really works. Photographers have different requirements than a quilter. That's why any of these suggestions will work for quilters! Some light boxes are designed for Visual Artists who have a need for tracing an image to another surface. Basically this is why a quilter uses a light box too. 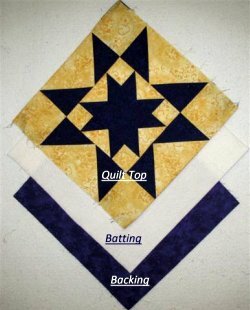 But Quilters, on the other hand, use light boxes in applique quilting to "break apart" a pattern in order to “paint” with fabric. You can build a light box very inexpensively. 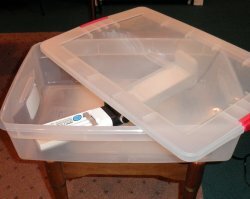 Start by using a large clear plastic storage box which could cost under $15 dollars. Most likely you will have one sitting around full of “stuff” which you can unload temporarily and use. 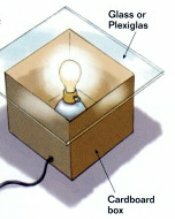 Make sure that the box is deep enough and long enough to add your light with a little room to spare. The lid should be relatively flat as this will be your drawing surface. An ideal size plastic box to build a light box would be at a minimum of 6-inches deep and around 20 to 24-inches long. The shallow tub is a perfect height when you sit the box on the table...a taller tub may be uncomfortable for you to work from. It is important to protect your back whenever possible. Cut an elongated hole in the side and close to the bottom of the plastic box With a utility knife. Make sure the light plug will fit through the opening so that you can plug the light into an electrical outlet. You can use an Ott lite if you have one. Ott lights are slightly under $100 dollars and a bit expensive so don’t go out and buy one just for this project. Any flat fluorescent light from Wal-Mart or Targets that cost under $5 will work just as well. You can also use a battery powered, under-the-counter type light, in place of the Ott lite. They, too, are inexpensive. If you find that the lighting needs to be diffused, place a piece of white paper or an opaque plastic film over the top before you secure your pattern to the top. Not being able to clearly see where you are in the drawing process can be frustrating. You can build a light box out of wood but it will be heavy to tote around. 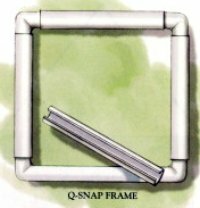 This is an important consideration if you plan to share your light box with any quilting group that you may belong to. 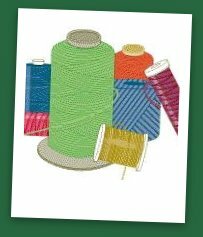 By joining a quilting group you can learn a lot about quilting. If there isn't one in your area, form your own. Inviting a few quilters over for coffee. You will see how quickly your learning will be enhanced by sharing. Another idea for building a light box is to simply use an old flat-bed scanner that is no longer being use to scan pictures through your computer. Don't buy a new one just for this purpose. Make sure the unit lights up without being connected to the computer. Sometimes the scanner whether it works or not to scan pictures must have electricity from the computer in order to light up. Unplug a scanner from your computer; but do plug it into an electrical outlet. Some units light up this way but not all. So this method is trial and error. One other disadvantage is the lid could be permanently attached to the scanner body which makes it cumbersome to work with. If the light is too bright, place a piece of white paper over the glass to diffuse the light. An opaque piece of heavy plastic would work too. You may want to keep your eyes open for a used scanner at a yard sale or thrift store if you don’t have one. Make sure the cord has a male plug for an electrical outlet and that it lights up without being attached to the computer. This is yet another idea for building a light box. The acrylic extension table that I use for my Husqvarna Viking sewing machine has leveling legs that allow me to extend the back legs 4 1/2-inches while the front legs are at 2 1/2-inches. This provides a perfect slant from which to draw from. I use a "stick-up" battery operated light under the unit which makes just enough light and does not hurt your eyes. I applied clear fabric grippers which are made by Dritz to all four corners of the piece of Plexiglas which holds the overlay securely in place. I then wrapped green painter's tape on the edges of the Plexiglas so the surface would be scratch resistant. This is light weight and requires no electric which makes it the berries for taking to group quilting meetings. 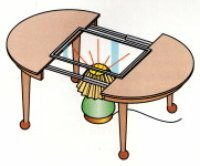 If you have a kitchen table that is supported by four legs and is capable of receiving expansion leaves this is another way to build a light box. Of course, this method is not transportable and you must go to it. A table with only a center leg will not work either. The beauty of this one is you are at the right height when drawing. Open the table and place a piece of Plexiglas across the opening where the table leaf was. If you do not have a piece of Plexiglas big enough, just use a storm window. Then set a table lamp on the floor under the opening. Turn the light on and you have a perfect light box. Reduce the wattage of the bulb if necessary. 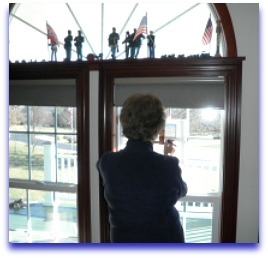 Or you may need to fog or shade the Plexiglas from the light underneath to reduce the glare. Of course, if you are in a situation where there is no light box and you have not yet built a light box, then use any window pane in your home. This is my all time favorite way to build a light box! Simply tape your pattern on the window pane using masking tape and then tape your drawing paper over the pattern and draw. The only requirement is use daylight hours and if it's raining outside it still works! Since a light box is not an absolute necessity, but it can be real helpful at times, why not use any of the above suggestions to build a light box for your sewing room? When you make your own light box there is a sense of pride and the savings is phenomenal.